I won't judge this time. I leave it up to you. 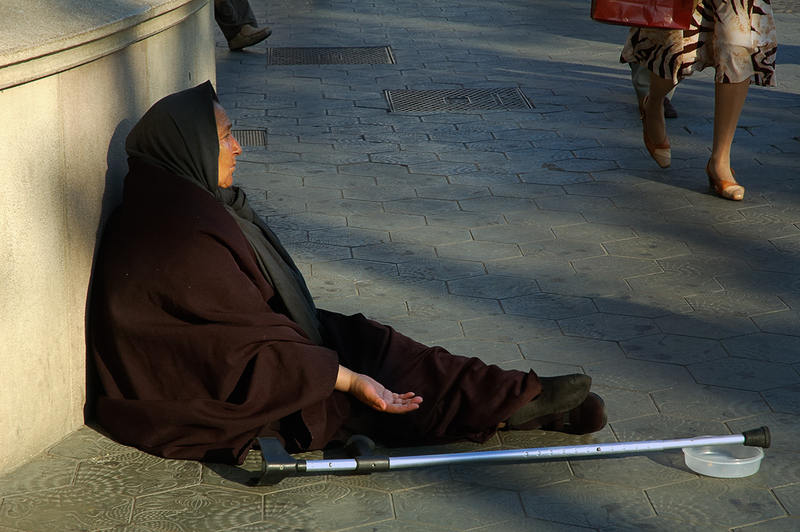 This is a woman begging on the corner of Passeig de Gracia and Plaça Catalunya, just in front of El Corte Inglés. One of the richest spots in Barcelona. It was a very hot afternoon, the normal kind of day this time of year, the same all stuff, lots of people, sweating all over. And there she was. People seemed to draw a safety perimeter around her with their feet. The same old story. Bien compuesto ese contraste entre personajes. Tuve suerte de poder incluir a la mujer. Me gusto el contraste. Gracias. Unfortunately, this scene is the same all over, only the people and their dress is different. When we were walking around downtown Nashville Saturday evening, we passed a number of beggars, and people walked around them in the same way. Nashville does have a program asking people NOT to give them money, though.